​The climate engineers have the power to chemically cool-down surface temperatures when enough atmospheric moisture is available to them. The more heavily and extensively the geoengineers utilize chemical ice nucleating materials, the more extreme the surface cooling that they can create. This is not speculation, but verifiable fact proven by patented processes. One example is below. Mainstream media covered the fact that Chinese scientists are engineering snowstorms, are we to believe that the US government and others aren't doing the same? The US military is as large as the next 10 largest militaries combined, thus they have the ability to carry out climate engineering (weather warfare) operations on the largest scale by far. Not only have US military commanders stated that the disintegrating climate is the greatest national security threat, they have long since stated their objective of "owning the weather". Are we to believe that our government would ask our permission before deploying climate engineering operations? In fact, our government's own documents prove climate engineering has been ongoing for decades. 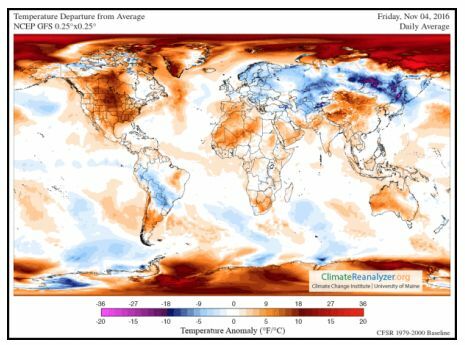 The “departure from normal high temperature” map below (from Dec 29, 2017) clearly revealed where surface temperatures were cold, and where they were not. ​In order to engineer an end of year cool-down for parts of the US and Canada, the flow of moisture from the Pacific (that was until recently directed completely around California) was chemically nucleated by the climate engineers. What happens when these endothermic reacting materials rain down on far above freezing bodies of water like Lake Michigan? (the majority of Lake Michigan is still at nearly 45 degrees F) Perfectly spherical ice balls form and start washing up on shorelines. The chemical nucleating elements form a nucleus around which ice continues to form. How about all that temporary ice along the US East Coast which the media did their best to sensationalize? Did anyone bother to check the ocean temperatures? ​Why is so much ice forming on ocean waters that are 40 degrees F or higher? 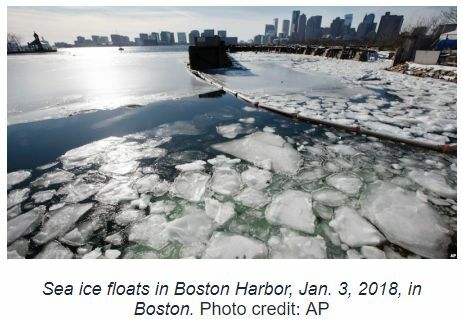 This fact should also be remembered and considered, sea water does not freeze until it reaches 28.4 degrees F. “Slush Waves” were also recorded along the coast near Boston, why are no official sources questioning this? Why are no official sources offering any reasonable explanations for such a phenomenon when ocean temperatures are 40 degrees F or higher? The answer is because they are not allowed to tell the truth. The illegal federal gag order on all National Weather Service (NWS) and all National Oceanic and Atmospheric (NOAA) employees should be a glaring red flag. Surface ice storms are also now a constant threat due to the chemical ice nucleating elements reaching the surface before solidifying. ​How warm is the East Coast scheduled to get after the engineered weather whiplash cool-down passes? 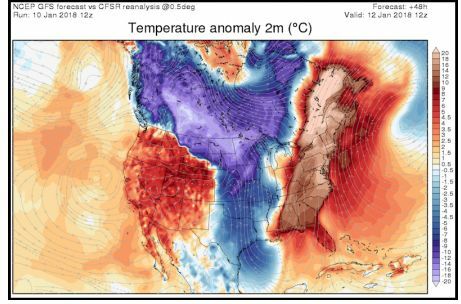 The “departure from normal high temperature” map below paints a shocking picture of East Coast warmth (in close proximity to a chemically nucleated cold zone in the center of the US) that was scheduled to follow on the heals of the media hyped (and completely engineered) “winter storms”. Will the geoengineers be able to alter the outcome of this "forecast" with yet another engineered cooldown? Winter storm “Hunter” is the next theatrically named creation of the climate engineers that will follow the temporary weather whiplash warm-up. The top 3 superpowers (USA, China, and Russia) have the largest militaries, and thus the greatest ability to effect the climate with their ongoing chemical ice nucleation cool-down operations. It is important to remember and consider that the majority of nations are either actively or passively participating in the global climate intervention programs. 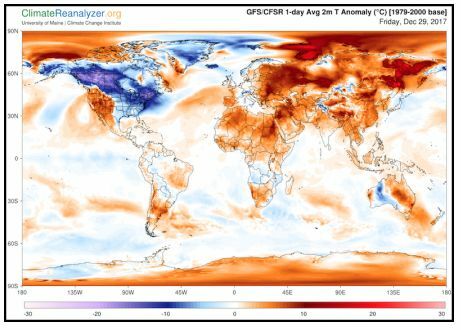 Comparing the more recent scheduled temperature anomaly forecast map below with the map shown earlier in this post reveals a number of profound weather whiplash changes occurring in the space of only a few days. Greenland has gone from far below normal surface temperatures back to far above normal temperatures, the eastern US has done the same. 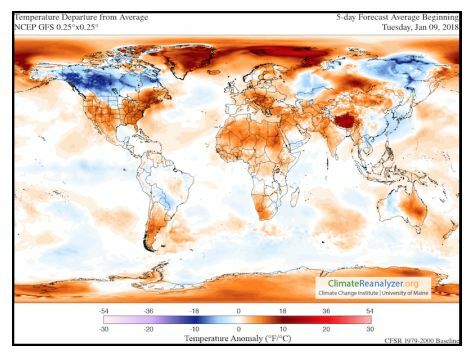 Conversely, portions of Russia and China have done the opposite, going from far above normal to below normal. The geoengineered winter weather whiplash scenarios will continue to worsen rapidly, patented chemical ice nucleation processes are a primary factor. It must be remembered and considered that all "predictions" (scheduled weather) are in a state of constant flux. So much depends on what the climate engineers choose to do (or not to do) at any given window of time. 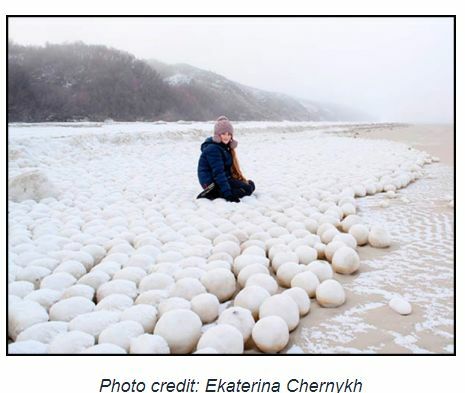 ​Headlines from Siberia reveal an incident of uniformly spherical "ice boulders" suddenly washing up on the shores of Nyda, Russia. Are we to believe this is only an "act of nature" as "official sources" have told us? ​Why would the "ice boulders" occur with Arctic sea ice at record low levels? 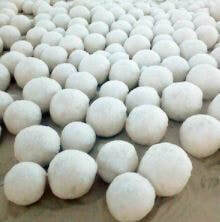 Why would perfectly spherical "ice balls" occur at all? 2012 was the previous record Arctic ice low for this time of year, 2016 has shattered that former record. 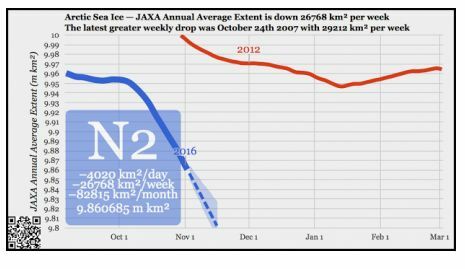 2017 has brought yet another new record low level of Arctic sea ice. 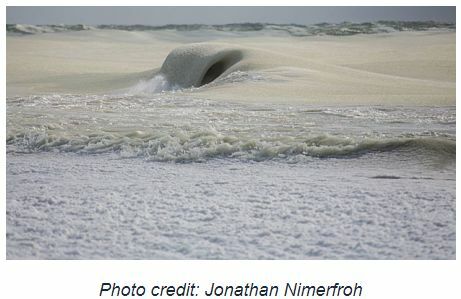 Why would such formations occur from the record warm Arctic Ocean? 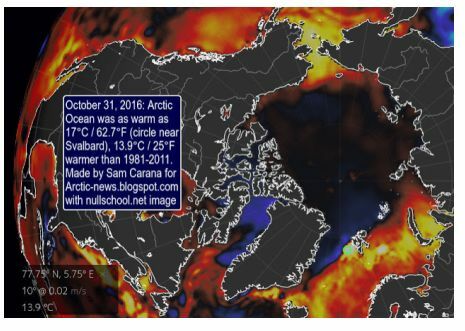 Sea temperatures in some zones of the Arctic Ocean have been as much as 25 degrees above the 30 year average. This average was taken from 1981-2011, when the ocean temperatures were already warmer than the pre-industrial era. Go to www.geoengineeringwatch.org/geoengineered-winter-weather-the-chemical-ice-nucleation-factor/ for more!